Not surprisingly all the recent media attention given to the Mustang is focused on the Shelby GT500 and GT500KR. Both are ultra fast performance cars with 500 and 550 horsepower on tap respectively. Most performance-oriented buyers will never have the opportunity to own or even sit in one of these new rare Shelbys. But then again most people who do get the opportunity to own one of these horsepower monsters, they probably won’t be driving it much keeping it as a collectible. However the good news is that the car that offers the most bang for the buck in the Mustang fleet is the Mustang GT, and it’s almost as easy to buy and own as your run-of-the-mill boring family sedan. To get an idea of how great this feat is, let’s consider the base price of a 2008 Mustang GT is a mere $26,240. And for this low base price a Mustang GT buyer gets through the 1/4 mile in 13.8 seconds and from 0-60 mph in about 5.3 seconds when buying the Mustang GT. There is not one new performance car that costs less than the GT that goes faster than it. Not to mention these performance figures are exactly the same as the legendary 1969 – 1970 428 Super Cobra Jet powered Mustangs. However this fact is always overlooked by most the auto press which is not surprising. The Mustang GT is such a good-looking automobile; it’s so easy for its looks to mask all the other great aspects of this car. Ford really caught the competition off guard when the 2005 Mustang was released. 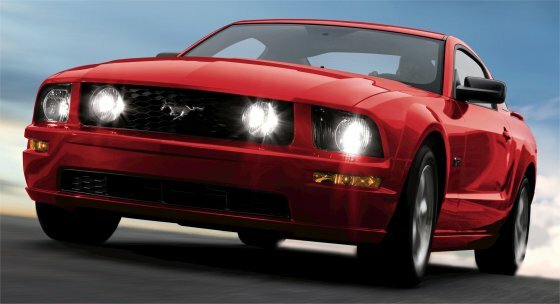 The previous Mustang design was attractive and had many fans. But Ford wanted to go one better by releasing a modern retro design combining past design elements of both the 1967-1968 and 1969 Mustang. It was an extremely risky proposition but turned out to be a tremendous success. In fact it may go down as the most successful retro styling in automobile history. The new Challenger is another great success story but the Mustang must get the kudos. After-all would there have been a new Challenger if there was not the very successful new retro Mustang? Probably not. Further proof is that the Mustang’s current exterior design is four model years old, yet it still looks as fresh as its release in the Fall of 2004. The Mustang has stood the test of time, back in the 1970s the Mustang fell off the performance wagon and became nothing more than a cruel joke with the Pinto based Mustang II. Slowly Ford starting with the Fox bodied Mustangs (released in 1979) began to repair the damage it had done to the Mustang name. It took 30 years of work but now it’s a given that the Mustang is America’s 2+2 coupe. The Camaro and Firebird are long gone. The Camaro may return for 2010, however we won’t know for certain until the first 2010 Camaro rolls off the assembly line. We know the Mustang GT is fast but now for the specifics. Ford abandoned the pushrod V8 in the 1990s for a more modern SOHC (single overhead camshaft) and DOHC (double overhead cam) V8 block designs. The Mustang GT which had as its main V8 since 1982 the 5.0 liter HO (302 CID) V8, was forced in 1996 to use as its new engine the 4.6 liter SOHC V8 that produced 215 horsepower. The 4.6 liter proved to be up to the job, and provided the GT with good performance. However at the time the new Chevrolet Camaro Z28 and Pontiac Trans Am had a 5.7 liter LT1 V8 (rated at 275 horsepower), trampled the GT with ease. By 1998 the SOHC 4.6 liter was a very healthy 260 horsepower. When the retro 2005 Mustang was released the GT’s SOHC 4.6 liter was up to an impressive 300 horsepower. The GT’s SOHC 4.6 liter V8 has 24 valves (3 valves per cylinder), VCT (variable camshaft timing), and CMCV (Charge Motion Control Valve). The CMCV keeps emissions to a minimum while VCT provides optimum horsepower at the best possible efficiency. The end result of all of the above is 300 horsepower and 320 lbs/ft of torque giving this motor plenty of punch while also having the added benefit of 26 mpg on the highway. There are two transmissions available on the Mustang GT, the Tremec 5-speed manual transmission and an optional 5-speed automatic transmission. Of course the Tremec is the more fun of the two, for the traditional gear head who loves shifting the gears. The 5-speed automatic does provide a nice compromise for those who live in urban areas and don’t want to fiddle with releasing and engaging a clutch 500 times during a morning commute in rush hour traffic. Even Mustang owners will admit that handling has never been Mustang’s strong suit in the past. Over the years the suspension, braking, and steering have improved. Today the Mustang can hold its own in all these areas against some of the best new performance cars. The current GT’s skidpad of .87 is very impressive, and even more impressive is how well balanced the suspension feels hitting the curves. The front suspension is a MacPherson design with reverse "L" lower arms, and the rear suspension consists of a three-link solid rear axle. The GT comes standard with 17" wheels and 18" polished aluminum wheels are optional. In the looks department, no other car has anything on the Mustang. Its facade is the perfect blend of the best of the old Mustang mixed with modern flair. To sum it up, the new Mustang is a sheer masterpiece; every line and curve is appealing to the eye. Very few who look at the car can look away without taking a second look. The GT takes the Mustang’s styling one step further in sporty looks with big round driving lights mounted in the grille, a rear deck spoiler, and an optional attractive non-functional hood scoop. Only recommendation I could make to Ford to improve on this almost perfect package is to offer a functional shaker hood scoop as seen on the previous generation Mach I Mustangs which was a modern version of the optional shaker hood scoop found on the ’69 – ’70 Mustangs. There’s no mistaking a new Mustang for any other car on the road. Someone would have to be pretty inept or have never seen a car before to not recognize the new Mustang as being a Mustang a block away. If you had a time machine and could go back in time to 1969 and bring back five people, all five would recognize the new Mustang as a Mustang immediately. The only problem I see that Ford has with the new Mustang is that it will have a difficult time improving upon its design when it gets updated in 2009/2010 time frame. Ford, I am sure will take the smart route and only make slight cosmetic changes not wanting to leave to chance the possibility of ruining the Mustang’s perfect looks. How many times do you see a beautiful exterior design, yet then enter into the interior and you feel short-changed? Too many in my opinion, with the GT that is not the case the interior has a beautiful retro yet modern look. This can be seen in everything from the layout of the gauges, dash shape, seats, and even steering wheel. But it is all 100% functional, and it’s easy to figure out what everything does. Put another way you won’t have to pull out the owner’s manual to figure out how to run or read something. It used to be driving a sporty car or muscle car meant you had to deal with uncomfortable seats or seating position. In the new Mustang GT, the seats provide great lumbar support, yet are very comfortable. This is the type of muscle car you would not mind taking a trip from New York City to Los Angeles in. Of course you’ll probably get a few tickets on the way to LA, because it’s hard to not have a "lead foot" in this exciting car. The traditional muscle car fan probably would spend most of the time during this 3,000 mile trip with the windows down listening to what has to be the best new car V8 sound/rumble emanating from the true dual exhaust system. This is the type of car you could almost subsist without a radio. But for those who like their tunes Ford has not forgotten thee, there are different sound system options like the (1000 watt) Shaker 1000 system and a Sirius radio option. And for those who get lost easily there is an optional DVD navigation system. Now comes the fun part, the convertible top option. For those that love wind-in-the-face motoring the convertible top option is available on the GT and a popular one at that. So much emphasis is placed on the old muscle cars from the golden era, it’s so easy to forget that there’s a brand new Mustang GT available at such a reasonable price that could run with the best muscle cars of yesteryear. With the new CAFÉ (Corporate Average Fuel Economy) standards as passed into law last year looming in the background a big dark storm cloud is descending. The Mustang GT may not have many years left in its current form as a new inexpensive fun V8 powered muscle car. The days of the Mustang II with 130 horsepower V8s or even worse may be right around the corner. There are performance cars that make more horsepower but nobody can beat the bang for the buck the new Mustang GT provides. It is indeed the perfect package, providing the most performance for the money for the average Joe or Joanne.